Take a look! The DJ/Owner of Savoy Jazz Club that everyone raves about finally takes to the stage with a set of vibes. He can spin an incredible set. Have you heard his set that emphasizes vibes? It is worth a listen. Parker and Iso and Wolke are right... this guy does know his stuff. And, he even can remember it and articulate it while battling his kitty DJ sidekick in RL, and eating a bowl of ice cream! Thanks Kimala....great pic! I was trying to channel Milt Jackson there...hehe. 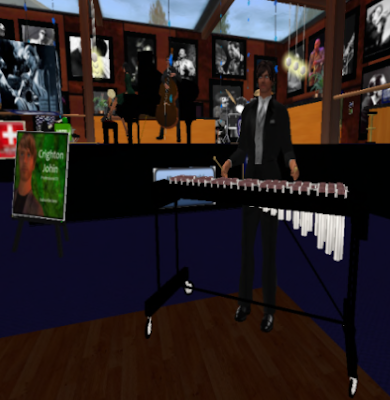 The Savoy Jazz Club is a jazz club in the virtual world of Second Life that is dedicated to real jazz and blues music. The Savoy is all about the music, not fancy contests and gimmicks. If you love Satchmo and The Duke, Miles and Trane, Monk and Bird, Buddy and B.B., then the Savoy is for you.